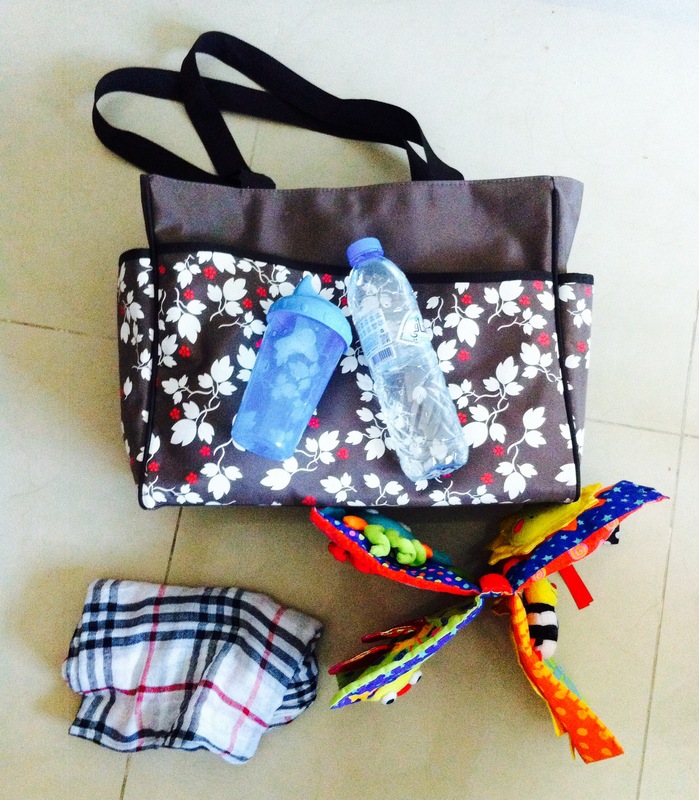 When you are out and about with your little one, you are not just a mother, you are also Mary Poppins, with a trunk full of items that can make the difference between a successful outing and a tragic ending! 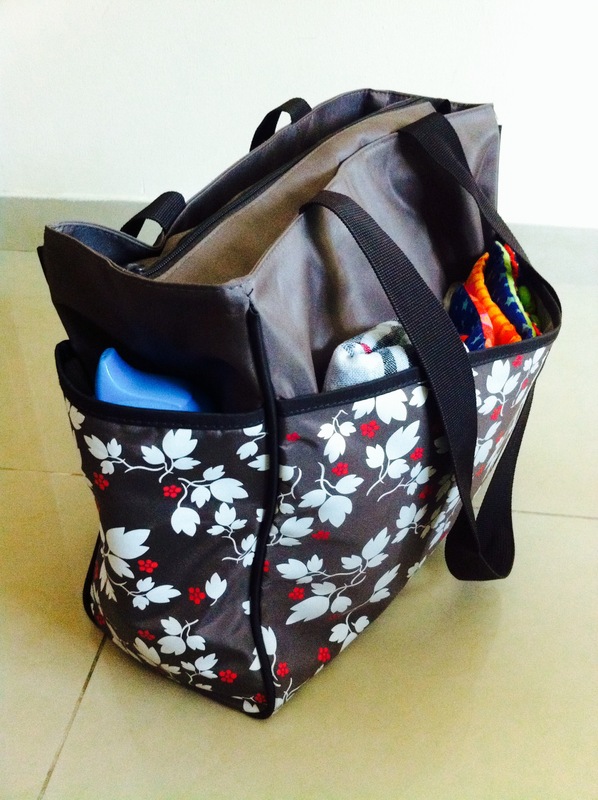 This magical trunk is well known by the name of “Changing Bag”, and here’s a look into mine! BabyshopUAE have the most amazing collection of Changing Bags. My way of choosing them is asking my husband to parade around the shop with them to see which one he would be comfortable walking around in (He has a phobia of handbags) and let’s face it, it going to be him that will be carrying it around most of the time anyway! Our first changing bag was absolutely huge and had all sorts of pockets and contraptions, all of which came in great use for a new born. We used it till it was torn and worn, and now that Baby Z is turning ONE, he doesn’t need as much as he used to when he was a new born. 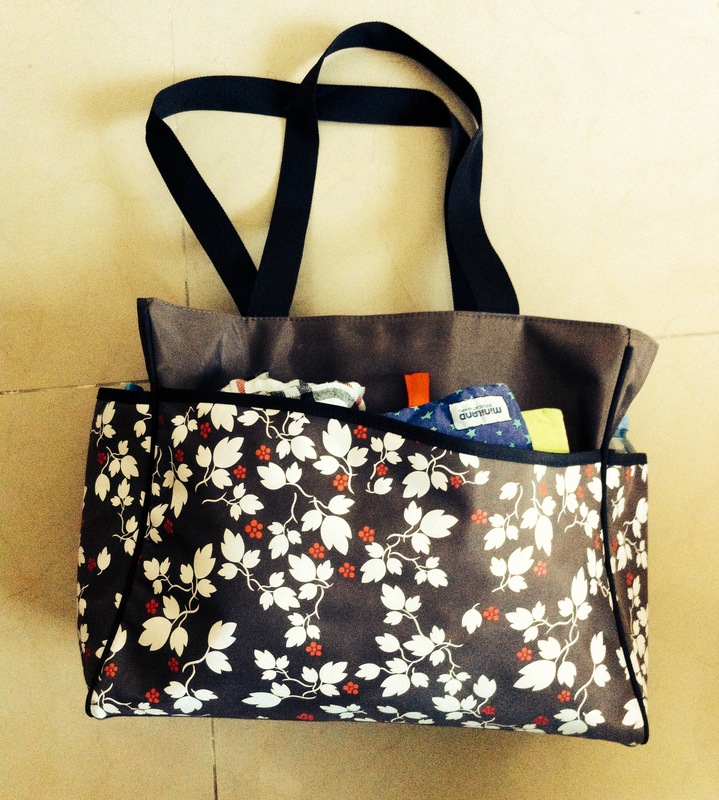 This new changing bag upgrade is lightweight and just the right size to fit in all that is needed. It has two side pockets, and a big front pocket. The colour is a dark shade of brown, with white leafy patterns. 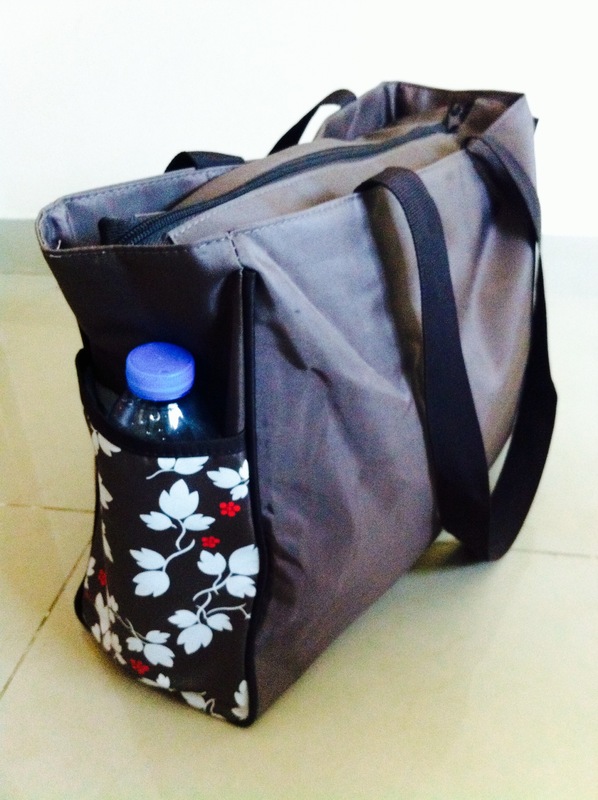 One zip opens the main compartment, with two straps on either side. The most used items are kept at the top within close reach, so that me or my husband are not faffing around when Baby Z throws a tantrum! In the two outer pockets is where I keep a water bottle for me and a sippy cup for Baby Z. Living in the heat of Dubai, these are my most reached for items. 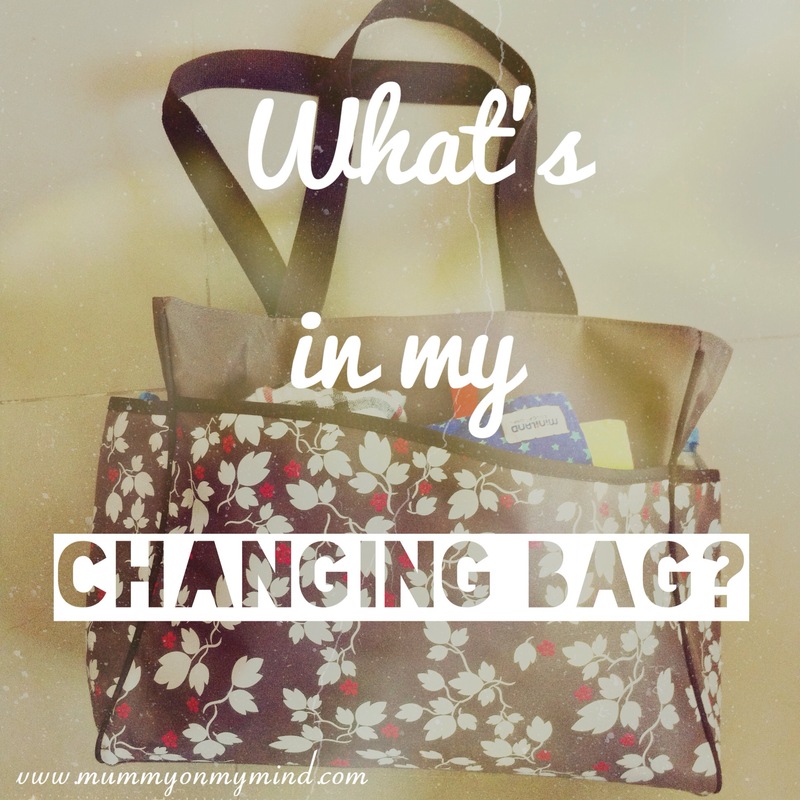 Inside the outer pocket of the bag, I keep a shawl to cover myself for when I am breastfeeding Baby Z in public, and his cloth book which keeps him entertained whilst we wait for dinner at restaurants, or when I am taking particularly long in a clothing store! Inside the bag, I keep two blankets, woolen hat, a loose knitted jumper, change of clothes,a cloth bib and a pair of socks. Although it is very much hot outside and already feels like the height of summer in May, Dubai tends to crank up its Air Conditioning inside malls, so much so that you can find yourself shivering! 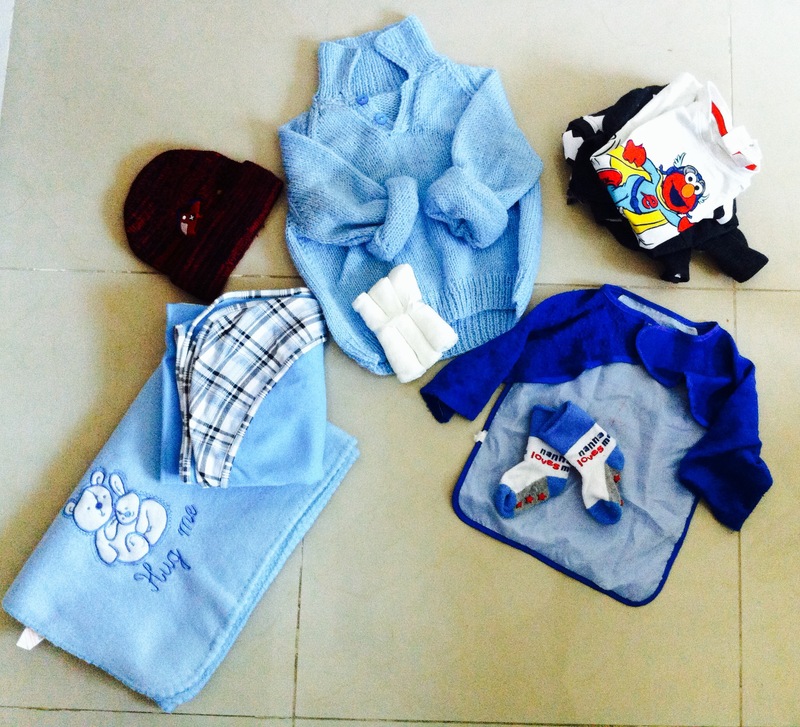 That is why there is an array of winter wear that I also pack for Baby Z in his changing bag! The change of clothes is for those moments when Baby Z decides he wants to empty the contents of his sippy cup onto himself, like he did last weekend! 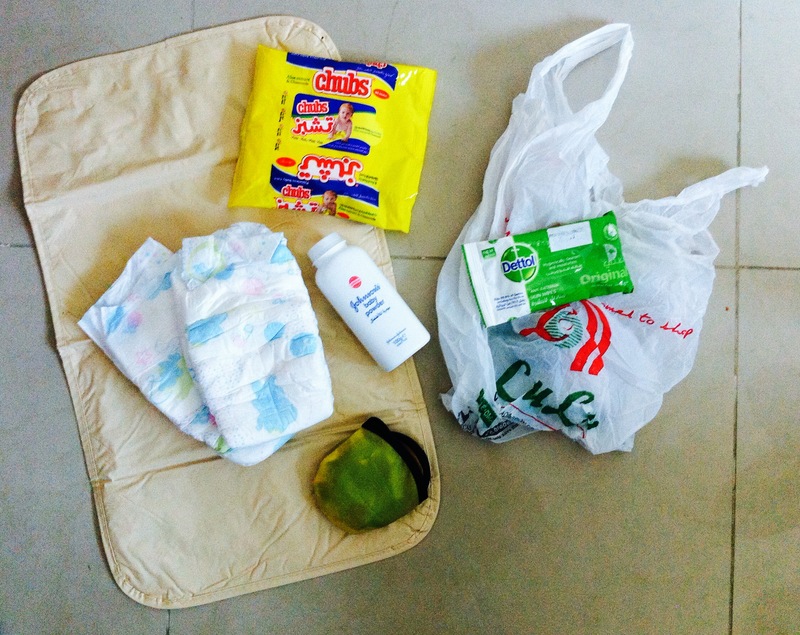 The crucial part of the changing bag is of course the nappies, the changing mat, Chubs Baby wipes and Jhonson’s Baby Powder. I also take a carrier bag with me to dispose of the used nappy, along with a set of Dettol Hand Wipes. I think my most memorable nappy changing moment to date has to be when we were at the top of Jabel Hafeet (a mountain that is 1,249 metres high, located on the outskirts of Al Ain, UAE). I am sure that was a Guinness World Record for Baby Nappy changed at the highest point on Earth! I also grab a pot of snacks before we head off on any outing to ensure Baby Z is able to munch on something when he gets hungry or needs to simply be entertained! So there you go, now you knows what’s in my trunk of magic that is called The Changing Bag! What’s in yours? Am I missing something that is absolutely crucial? Please feel free to share in the comments section below! Me too! I also havn’t found a handbag big enough to fit all that I need! I love changing bags so much. Although my daughter is 7 years old, I still have one with baby wipes, snacks, drinks etc etc. They are so useful…they should be called Mummy Bags. Haha you’re right! They really should be called Mummy Bags! We also have socks as locals judge us if they deem in to be cold and the tot is not wearing socks. Note: shorts and t-shirt are fine, socks represent the crucial difference between neglect and love. A million snacks and formula also feature. Can’t wait until we can do away with that in favour of cows milk! Haha yeah I don’t understand this fascination with socks but you’re completely right! Snacks are an absolute must! Yes, it sure is! Thanks for stopping by!